Recently I began wondering about many of these compostable products we’ve seen shops and restaurants switching to these days and what their true impact is. Shouldn’t the answer be obvious? I mean, they’re compostable after all! Compostable is always better, right? That nice cursive font on the side of my disposable coffee cup says “Compostable”, but does that mean if I throw it in my backyard compost bin it will break down into soil with the rest of my kitchen scraps? Or will I unearth it, untouched and unchanged a few months from now when I go to feed that compost soil to my plants? I stumbled upon an article a little while ago that considered the impact of these compostable items, which keep popping up in our lives as more and more well-intentioned companies put greater effort toward “being green”. A few days later I was listening to the podcast, War on Waste and heard them asking this same question. So when you go buy coffee, inevitably forget your reusable mug, and decide f-it, I’m in a hurry, I’ll just get the disposable cup to go, you feel a sense of relief when you see it’s compostable (most disposable cups aren’t even recyclable! More on that later!). Sigh. Forget the guilt, your neighborhood coffee shop has got your back. 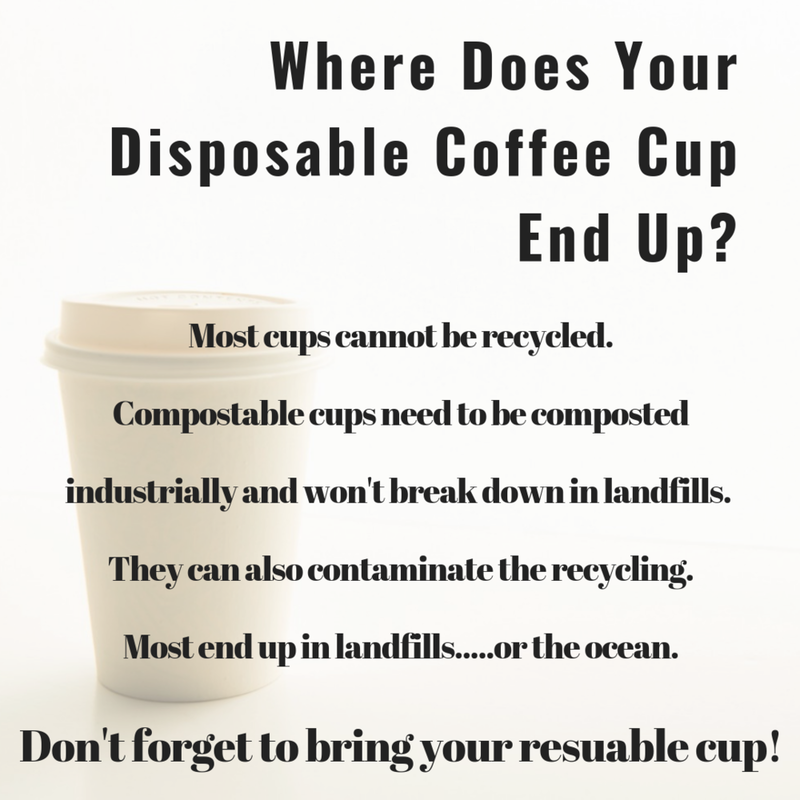 For the most part, those compostable coffee cups need to be composted industrially. If you are lucky enough to have access to industrial compost (we don’t! ), you need to ask if your facility accepts compostable dishware. In fact, many do not. If you take it home, it may or may not break down in your home compost pile. My mom was sifting through her latest compost pile and found a completely intact compostable cornware container that had been there for many months! She threw it back in with the next batch of compost to see if perhaps it just needed a little while longer...but it all depends on the heat of the compost pile and that is the big difference between home and industrial compost. If our backyard pile doesn’t reach the right temperatures, then decomposition of those materials can’t happen and there it sits. What happens If this compostable dishware ends up in the recycling? Well, because it’s compostable, it’s no longer recyclable. That’s an exchange that had to be made…. between making a disposable, recyclable, or compostable cup. You can’t have it all! Once mixed in with the recycling, that recycling is now considered “contaminated” and it may cause the entire lot of it to end up in the landfill. What if it ends up in the landfill? Won’t it break down faster than other materials? Well, that’s up in the air, but we do know that composting requires oxygen, which you won’t find in most “sealed” landfills. The frequency with which we’re seeing these commercially available compostable products is evidence that our culture is, albeit slowly, shifting toward recognizing how our fast consumption is impacting the world around us. We’re all seeing the shocking images of plastic-strewn beaches or dead birds who’ve ingested plastic, and as this culture shift is occurring, we all want to feel better about the impact our habits and our daily lives are having on the world around us. This compostable trend is feeding into that, and rather than trying to shift away from the concept of “I need it” to immediate satisfaction of that need, we’re trying to find was to make the immediate fulfillment more palatable for the planet by switching to these also quickly-consumed “green” alternatives. As much as we want to have these “green” options in our lives, the most “green” option is to plan ahead, slow down, and remember that reusable mug or take a deep breath and order that coffee “for here”. Take a moment to sip and relax and avoid creating some waste as you do. Working on decreasing our waste has definitely come with moments of hunger or thirst as we try to figure out the low waste solution for fulfilling these needs. We’re working on changing that equation from having a feeling of need with immediate fulfillment of that need, to sensing a need and pausing to figure out the least impactful way to meet that need or to stop and ask….do I really NEED it anyways??!!! Most times, I’ve found, the answer is actually NO, I don’t. We’ve had many of those f-it moments and have chosen the wasteful option for convenience or cost sake, for sure. We aren’t saints over here! We’re just doing our best in each moment and trying to not forget that #ouractionsmatter.